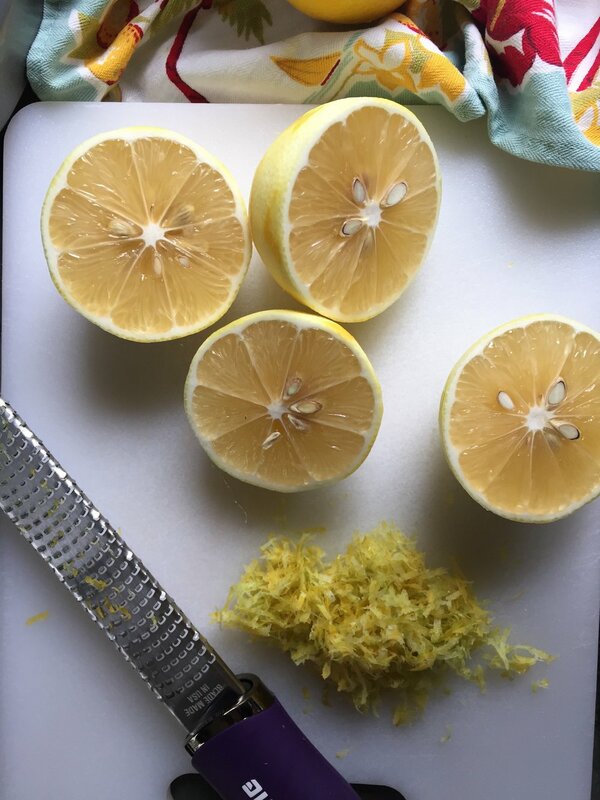 When life gives you lemons, make a beeline to the kitchen..
My citrus devotion stretches back to my childhood. The lime tree in our backyard created an unending fountain of limeade, a favorite thirst quencher. Our grapefruit tree provided sunshine at breakfast as we spooned jewel-like segments from the halved fruits with those jagged tipped spoons. On Sundays we stopped at a farm stand for bulging brown sacks of oranges which we juiced in shifts. Rinse, cut, squeeze, sip. I can hear the song of the juicer and taste the nectar of Mother Nature. My new surroundings now provide a welcome wealth of my favorite fruit group. I first recognized the familiar leaves on trees during a pre-move visit to Baton Rouge and celebrated my return to citrus country. The town is a virtual grove of delicious fruit. A satsuma tree serves as the property line between my house and the one next door, the fruits sequentially ripening on cue. This short and stout tree is heavy with ready-to-peel fruit. My sweet neighbor has the greenest thumb going and insists she has plenty to share. So I pluck one from the tree from time to time, zip off the peel and savor each juicy segment. It’s a fun treat to enjoy even in traffic and will brighten the cloudiest day. I thank her by bringing satsuma bars over and notice another citrus tree in the far corner of her tropical landscape. “Is that a Meyer lemon tree?” I ask. The next morning, before I had the first sip of coffee, I noticed a gift bag propped on the chair on my front porch. Yellow and green peeked out from the top of the bag and I raced out to investigate. Better than any golden ticket, I now have more than enough Meyer lemons to chase the blues away. First order of business, I dashed out to Sur La Table for a juicer and put it right to work. Its song is in a different key than the one of my childhood, but equally as sweet. This one hums as the juice flows and happiness surrounds me. I’ll bake a cake and continue with my list of citrus delicacies, some to keep and some to prop on the doorstep next door, and beyond. As I pondered the infinite possibilities of my lemon bounty, an invitation to a neighborhood gathering appeared. Dr. Donald Ingram, an expert in the health field, was scheduled to present “Blue Versus Gray: Possible Benefits of Blueberries for Healthy Aging” so it seemed appropriate to add blueberries to my lemon creation. With thanks to Brown Eyed Baker for the recipe inspiration. Heat the oven to 350 (reduce temperature to 325 if using a dark or non-stick baking pan). Butter and flour a 10-cup Bundt pan and set aside. Whisk together the 2 cups unbleached flour, the cake flour, the baking powder and salt in a medium bowl. Place the sugar in the bowl of a stand mixer (or large mixing bowl) and add the lemon zest. Mix on low speed to moisten the sugar with the lemon. Add the butter and cream together on medium speed until light and fluffy, scraping the bowl once or twice, about 3 to 5 minutes. Add the eggs one at a time, mixing well on low between each. Scrape the bowl and add the vanilla. Mix to combine, then add 1/3 of the flour mixture alternately with half of the lemon juice-milk mixture, mixing on low just until combined. Repeat with the remaining flour and lemon-milk, adding the last 1/3 of flour and mixing to combine. Toss the blueberries with the remaining 2 tablespoons flour (tiny wild blueberries work great here, keep them frozen before mixing into the cake batter) and gently fold them in to the batter with a rubber spatula. Spoon the batter into the prepared Bundt pan and smooth the top with the spatula. Bake until golden and just firm on top and a tester inserted comes out clean, about 50 to 60 minutes. Cool the cake on a wire rack for 30 minutes, then turn it out onto a serving platter to cool completely before glazing. Combine the powdered sugar and lemon zest, mashing together with a rubber spatula. Add the milk gradually, stirring to blend until desired consistency is achieved. Drizzle the glaze over the cooled cake and allow to set for a few minutes before slicing and serving.